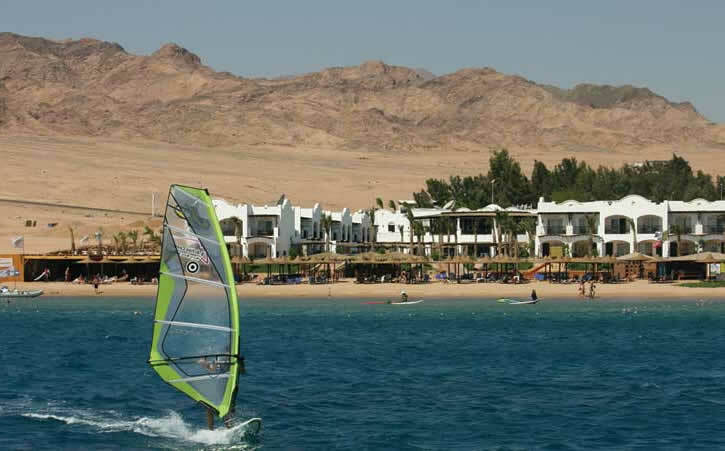 The 4* Jaz Dahabeya hotel, boasts a prime location directly on the sandy windsurfing beach. The hotel has a large swimming pool; and offers many animation team activities including volleyball, water gym, and stretching sessions. 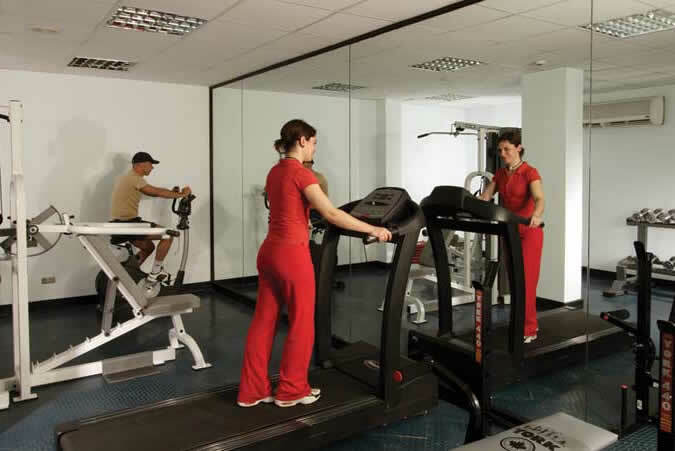 Modern gym, sauna and indoor Jacuzzi pool, massage rooms (extra charge). Windsurf and kitesurf centre on site. 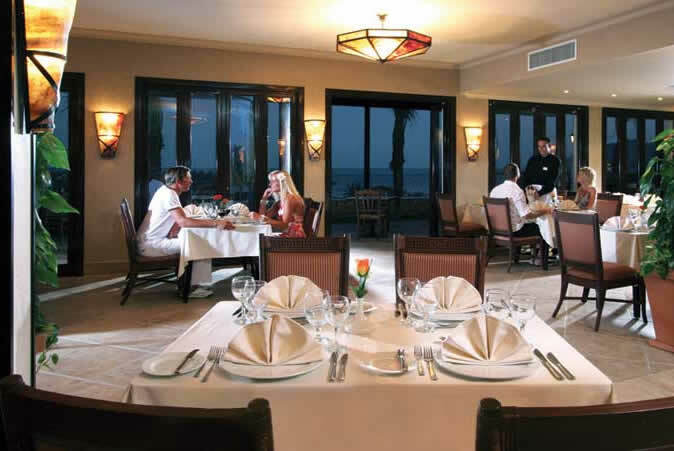 Facilities: Le Palmier restaurant for buffet breakfast and Mediterranean style/international buffet dinner. The 'Sea Breeze' beach bar and the pool bar are open daily, plus indoor 'Cheers' bar (open in the evening). Speciality evening restaurant. Snacks and ice cream available during the day. Complimentary sunbeds available by the pool or on the beach with wind breakers but this is a sheltered beach for sunseekers. Complimentary beach towels provided. Sandy swimming area with a few patches of coral further out for snorkellers. Half board or all inclusive board basis. Rooms: 144 rooms. All rooms have satellite TV, balcony or terrace, mini bar, digital safe, hair dryers and individually controlled quiet air-conditioning. 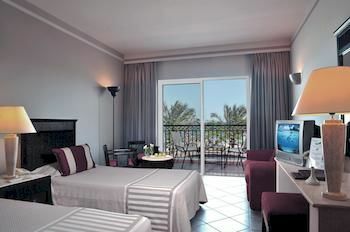 The rooms have views over the pool or garden and towards the Sinai Mountains. Sea view rooms also available. Superior rooms - twin or double with pool, garden or sea view available at a supplement (26m2). Family deluxe rooms with 2 bedrooms, sleeping 2 adults and 2 children with garden view (36m2). 1 Junior suite (86m2) with living room and sea view. 1 Royal suite (195m2) the large balcony has your own sunloungers plus living room. Watersports: Windsurf and Kitesurfing Centre (this is the best access to speedy for intermediate and advanced windsurfers and kitesurfers). Complimenatary boat to the beginner area from the windsurf/kite centre. Glass bottom boat trips, waterskiing, also available on the same beach. All of these facilities are an additional charge. 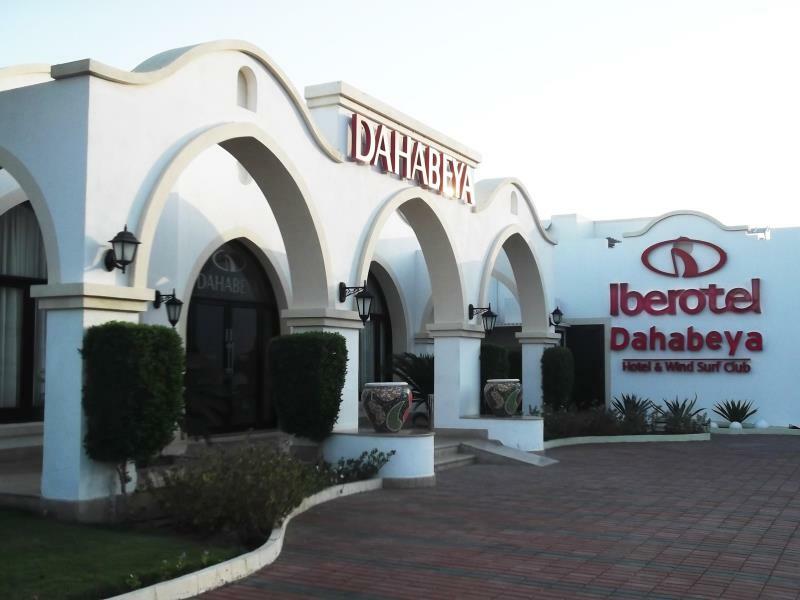 Hotel Sport and Leisure: Modern well equipped gym, main swimming pool, table tennis, pool table, water polo, boules, darts, beach volleyball and massage facilities. Additional services: ATM and money exchange machine onsite, wifi internet available (extra charge for high speed), outdoor play area for children. 24 hour reception. Children's Club from 4- 12 years old, 6 days per week. Please email us for rates with your dates.